Hi yannick, does that Z-wave plug also display power consumption in SmartThings? Yes it’s showing voltage, power consumption and amperage. How is the power consumption shown? Can you make a screenshot? How well is this behaving ? By my own admission I am NOT a Groovy Programmer, so this Device Type is mainly to solve a problem that I am having and it’s my first attempt - so please use with caution! This Device Type builds off the fantastic work that @CSC started with his own Device Type for the TKB TZ68E which solved a problem where the Blue LED on the unit would turn off when the device was on, and turn on when the device was off. This Device Type also worked well for the TKB TZ69E, but it didn’t include Power Monitoring which the new unit was capable of. So this Device Type is a merger of both Soon Chye’s, and the generic Z Wave Metering Switch. It seems to work fine for me - but please have a go yourselves. Are you incorporating the EU plug into the UK sockets using euro plug adaptors? Or have I misunderstood your application? I know this topic hasn’t been updated for 8 months but wondered what people are using currently? I have some greenwave powernodes that are great but no stock anywhere. it looks like the next best is the tkb tz68e which works well as i have a couple but are more expensive. any others i should know about? I’m using the Salus SP600 they’re zigbee and very small. They fit side by side on an extension cord. These look good, thanks for the suggestion. Search from ebay, amazon… nothing expect Osram plug which seems to be bad choice. 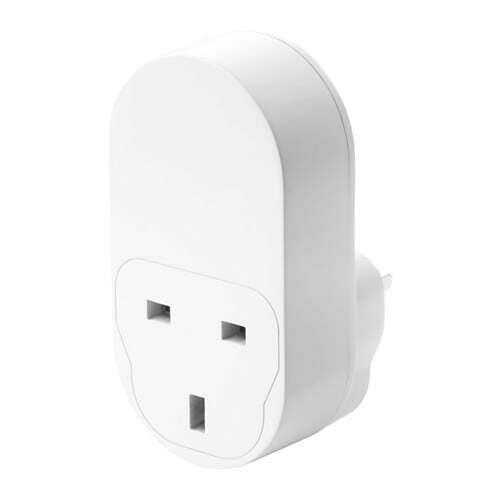 At this point, the least expensive plug in both the US and the UK is the IKEA Tradfri zigbee plug. Just a simple on/off device, but works well with SmartThings, is a zigbee repeater, and even repeats well for the Xioami sensors. It will say it needs its gateway, but you can use the SmartThings hub instead. £9 in the UK, $9 in the US, similarly low priced in other markets. It’s big and only has one socket, but as a zigbee repeater it’s a good inexpensive choice. IKEA TRÅDFRI Wireless control outlet You can use TRÅDFRI control outlet to connect a coffee maker or other small appliances to the app and TRÅDFRI gateway so that the appliance can be turned on or off with the app’s timer. Bought one in Finland. Just like was reported earlier, works fine after manually changing to a Zigbee Switch Power. Can also confirm works as a repeater, which is the reason I bought this. Devices that were earlier not connecting at the farther ends of my house connected immediately after the outlet went online near them. I already purchased couple of z wave plugs which are working great. I could buy couple of those too just to test how they work. They are really cheap!! Also, as far as repeaters go, Z wave repeat only for Z wave and zigbee repeats only for zigbee. So your Z wave plugs will be good repeaters for your Z wave devices. But the Tradfri plugs are zigbee, so they will work as zigbee repeaters for your zigbee devices. So lots of people will use some of each. Has anyone seen a UK power strip that is SmartThings compatible?